The most common torn rotator cuff symptoms that people present to a doctor’s office with are; shoulder pain in varying degrees of severity, difficulty sleeping on the affected shoulder, and quite often, difficulty raising the affected arm due to pain and “weakness”. Torn rotator cuff symptoms can vary from person to person, and can also vary depending upon the degree of the tear in the cuff tissue. Remember, on our page entitled; Torn Rotator Cuff , it was mentioned that a great many people walk around this world with no symptoms at all, with a partial rotator cuff tear and basically not even know it until it becomes considerably worse. Other torn rotator cuff symptoms can include “popping” or “cracking” in the shoulder with movements, or a specific incident that caused pain and weakness afterward, like a sudden jerking motion or a fall or a dislocation of the shoulder. Basically, there are two ways a torn rotator cuff can occur; First, from an acute (sudden) injury to the shoulder such as a fall, work-related injury or auto accident. The second way, which in all likelihood accounts for the majority of tears, is through a chronic worsening of a shoulder impingement problem or thinning of the cuff tendon tissue through the aging process. Let’s first get an understanding of “symptoms”. There are two types of symptoms; “subjective” and “objective”. Subjective torn rotator cuff symptoms are those that a person verbally relates to the doctor. For instance, when a person states: “I’m having constant pain in my shoulder” or “it hurts when I try to lift my arm”, these are subjective symptoms because they are what he/she “feels”. Objective symptoms, on the other hand, are symptoms that can be evoked or produced by way of an objective physical examination. One example of this would be, in the case of a completely torn rotator cuff, an inability to hold the affected arm up against resistance. This type of weakness can be considered an objective symptom. Another objective symptom would be stiffness of the joint due to chronic limited mobility. This can be measured in terms of degrees of elevation, extension and rotation. Weakness can be both a subjective and objective symptom. Evaluating subjective and objective symptoms is a critical component in arriving at a diagnosis of a torn rotator cuff. There are other, equally important diagnostic measures that must also be utilized to compliment the physical examination. One of the most rapidly emerging additions to the diagnostic tools at the physician’s disposal is the MRI (Magnetic Resonance Imaging). It takes up where x-rays leave off. 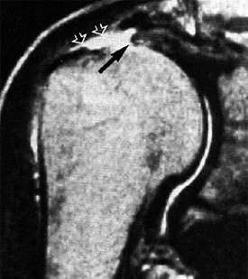 Standard x-rays cannot give nearly as good a picture of soft tissue as the MRI, even though they can offer good images of changes in bone secondary to the tear, like erosion of the undersurface of the acromion from the head of the humerus because the rotator cuff is no longer providing any cushion between them.. So, when we’re looking for a torn rotator cuff, which is made of fleshy tissue, the MRI captures that image with much better clarity and detail. 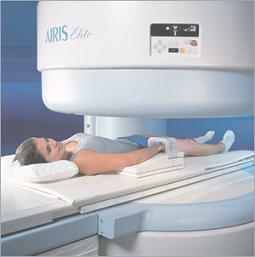 The pictures above show the two types of MRI machines; the “closed" MRI (left) and the “open” MRI (right). What is an MRI, you ask? Magnetic Resonance Imaging (MRI) is a non-radiation-producing diagnostic test in which the body, or body part, is subjected to a strong, localized magnetic field. This magnetic field causes the atoms in the cells of the body part(s) being examined to become “excited”. These atoms then all “flip” in the same direction. The magnetic field “hits” these atoms / cells and then sends back a signal that gets transformed into an “image”; which is what the doctor sees. The stronger the magnet; the clearer the image. This magnetic field can also be adjusted and fine-tuned in a variety of ways, enabling doctors to get high quality images of bones, muscles, tendons, blood vessels, and other tissues as well. The closed magnet MRI has long been seen as the cream of the crop of MRI equipment, and the bigger the magnet, the better the images. This is changing rapidly, however, as constant improvements in technology are vastly improving open magnet images. Many people cannot tolerate the “closed-in” feeling of the closed ring MRI, but some can endure it with sedative medication. Still, others simply cannot be placed into the “tube with feeling claustrophobic (fear of enclosed spaces). 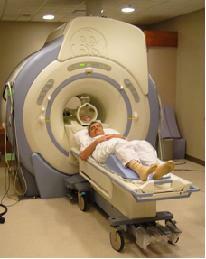 In these instances the open MRI machine is a necessity, and a blessing. These two MRI images at right show the head of the humerus with the rotator cuff lying on top of it. The cuff is typically dark in color. 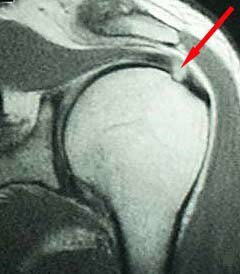 The bright white-ish spots (see arrows) are showing the "gap" that occurs when the rotator cuff tears and separates. In general, the greater the gap, the more the tissue has retracted back and the more potentially difficult the repair. Therefore, between torn rotator cuff symptoms, physical examination, x-rays and the MRI, one can get a really good look, and understanding, of the status of your rotator cuff. Once a diagnosis of a torn rotator cuff has been made, it usually results in the recommendation of surgical repair. One of the most common procedures for torn rotator cuff repair is shoulder arthroscopy . It can be performed in combination with a limited open cuff repair procedure, or, for the specially trained surgeon, repaired entirely by arthroscopic assistance.